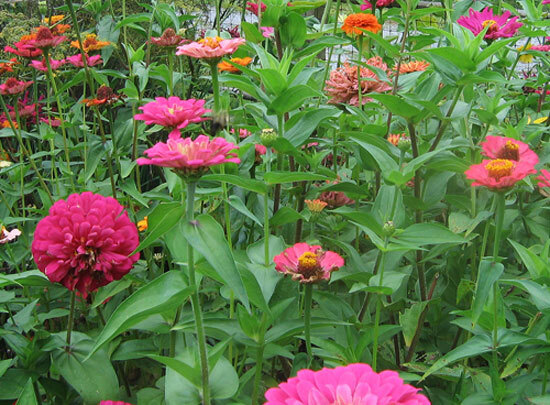 This is the Z Page of our A to Z guide to plants -- how to care for them, landscaping with them, and cooking and healing with them. This is one of the best annual flowering plants I can imagine. 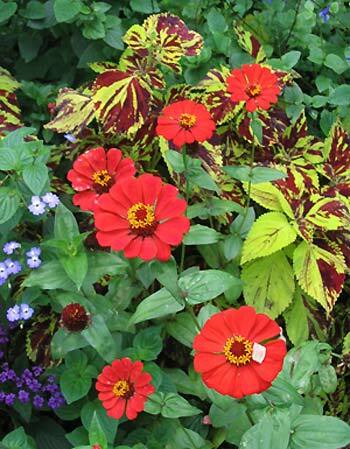 Along with giving us a choice of plant and flower size, it has a wide range of abundant and long lasting brightly colored flowers and petal shapes. This might also make it a good choice for a children's garden. 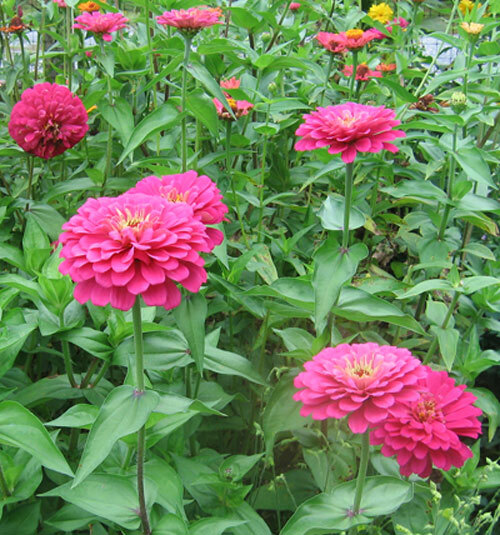 The only downside is it's tendency to suffer from spider mites and powdery mildew. 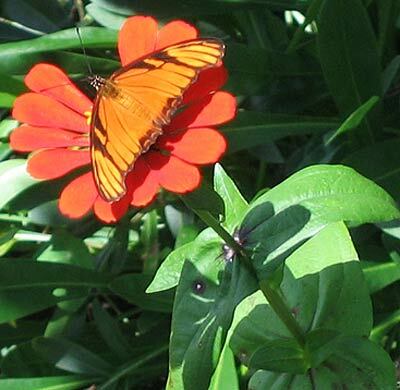 Photographed: On the the left in our garden at our former home in Montserrat. 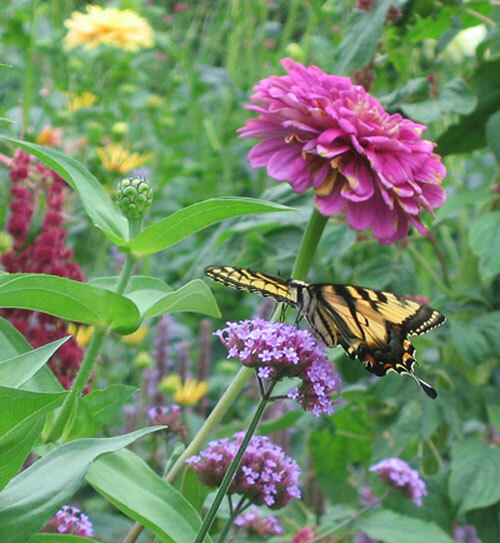 Planting and Growth: In more temperate climates plant seeds outdoors in a vegetable garden row and then transplant to your most sunny flower beds. 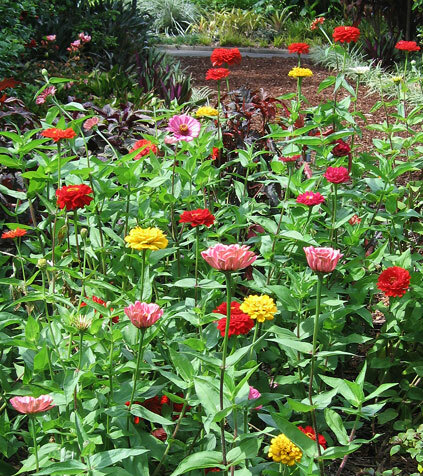 In more tropical climates, plant in seed starter situations and then transplant them to the garden where they will live to please you. 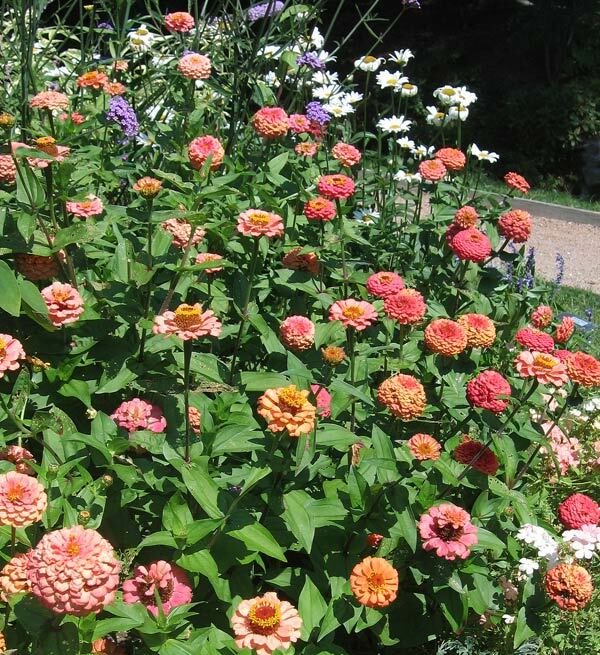 Zinnias need lots of sun and a moderate amount of watering or routine rainfall. 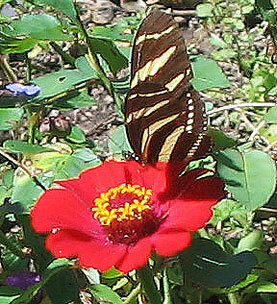 Photographed: In the Royal Botanical Garden in Sydney, Australia. 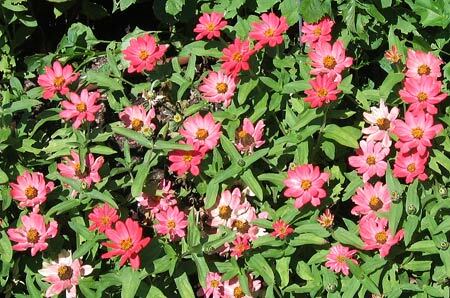 Photographed: In the Blithewold Garden in Bristol, Rhode Island 2014. 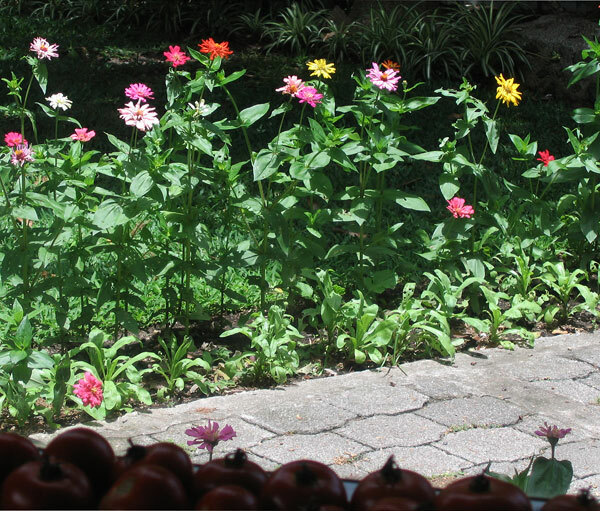 Photographed: Through my kitchen window at Lake Atitlan in Guatemala in 2013. **Zoysia Grass, Korean Lawn Grass, Common Zoysia grass Zoysia japonica Steud. This is the most wonderful lawn grass I've ever met! 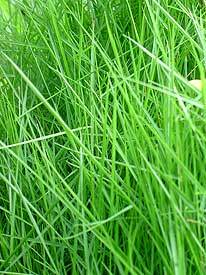 It is thick, lush and green all year and treated right it forms a soft cushiony carpet of a lawn. In Montserrat in the West Indies, zoysia is wonderful as most of what passes for lawn grass is considered some form of weed elsewhere. Amazingly, in the ten years we owned our home there we had the grass cut no more than four or five times. That's good for reducing noise pollution, conserving gasoline, reducing gardener expenses along with the costs of lawn mower purchases and repairs. Not a bad idea. Benefits: Zoysia grass is drought resistant and otherwise easy to care for. It feels like walking on a cushiony natural carpet. 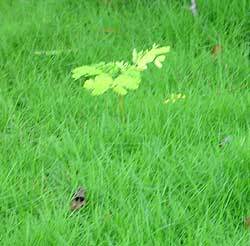 Planting and Care: Zoysia is a warm climate grass, not recommended for environments that have a cold winter as it is said to turn an unattractive brown in that situation. In the Caribbean and in other warm climates, zoysia is a delight as it is a deep carpet of green the year round, even when we experience months of dry weather. 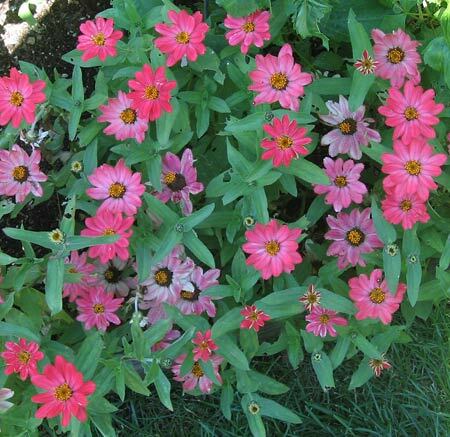 It is accepting of all types of soils and wide ranging pH levels, though it does prefer well drained soil. 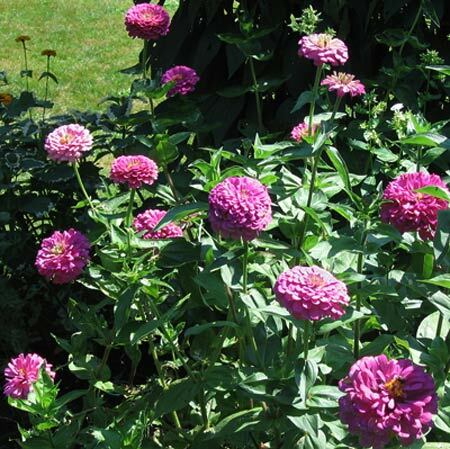 It is resistant to disease, wear and tear, salt spray, invasive weeds, and heat and drought. Still, people either love or hate this grass. My personal opinion is that people don't like zoysia because it doesn't require all of their time, chemicals, poisons, fertilizers and noisy lawn machinery on a weekly basis. What on earth is a retired fellow supposed to do on the weekend if he doesn't have a difficult lawn? 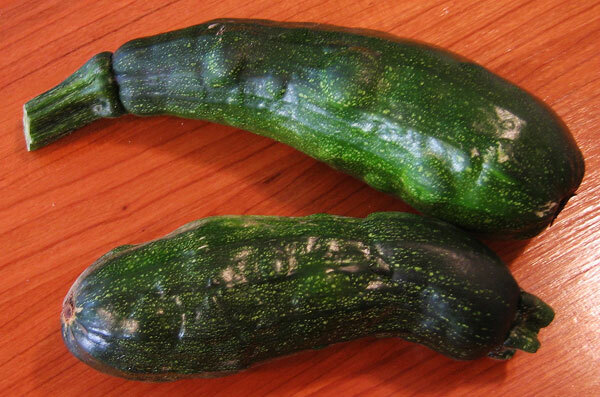 This is the long green summer squash that seems to have more varieties and common names than most other squashes. It is wonderful in all of its incarnations. In a New England summer, one healthy plant will produce enough squash for a family of five or so. And, if you aren't vigilant about harvesting the squash when it's young, you can end up with huge (more than two foot long squash) in a matter of a few days. In my garden in Takoma Park, Maryland, a suburb of Washington, D.C., I always had picture perfect plants and never ever had a squash. In the Caribbean, I hadn't even been able to keep a plant alive, but when I planted seeds I bought in Corfu, Greece, when we were there traveling I had some very minimal success. The squash they grow locally there looks a lot tougher than what is normally grown in the States. It is a sight to see as it is often sold in supermarkets with the flower still attached so you can enjoy the flower and the squash itself which has a slightly stronger flavor than its cousins overseas. If you look very carefully at the photograph you may see the one lone squash the plant produced. At our home in Guatemala we had great luck with zucchini, much like in good old New England summers, enough to eat and more to give away. One summer all that changed as you can see below. 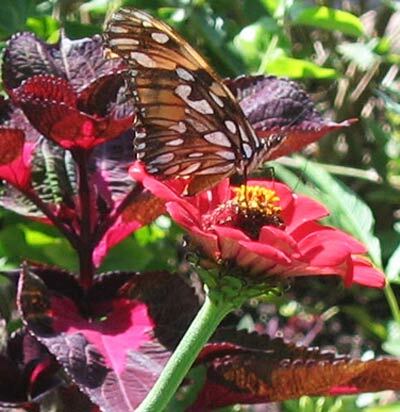 Photographed: On the right in our upper garden at our former home in Montserrat, in 2007. Below on the left and right at our home at Lake Atitlan in Guatemala in 2014. 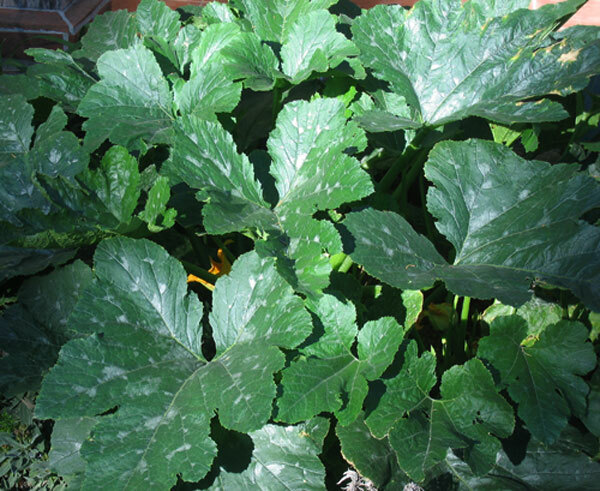 Planting and Care: Zucchini seem to prefer cooler summers than we had in Montserrat as they do beautifully in New England and in the highlands of Guatemala where summer temperatures never soar. 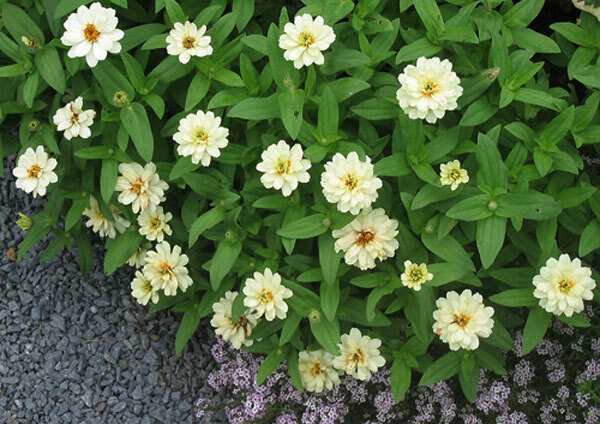 It prefers to have an even amount of rainfall or watering during the growing season. 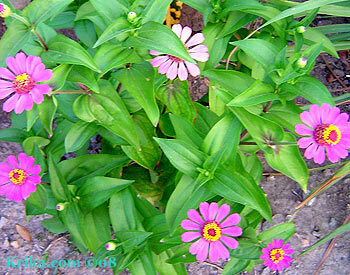 They like rich organic soil that is about a 6.5 pH. 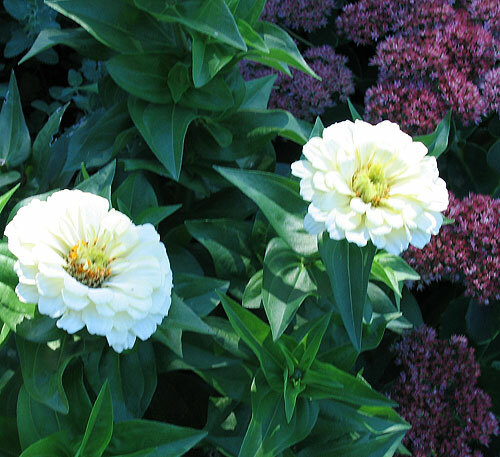 If you are watering your plants during dry periods, be sure to keep the water at ground level avoiding making the leaves wet and give them a good amount of space between plants so they may dry out quickly. In New England I produced enough zucchini from just a few plants to be able to set up a little 'free veggie' table by the walkway in front of our home. And, even though I had a large pressure canner I always filled the quart jars with chunks of zucchini using tomato puree from the garden as the liquid. This doubly ensured I wasn't going to kill anyone with botulism. GMO ALERT Apparently most of the zucchini you see in the market is now a GMO product. I'm assuming it was done to eliminate disease resulting from the virus below and to make it resistant to Bayer/Monsanto's carcinogenic Roundup weed killer. 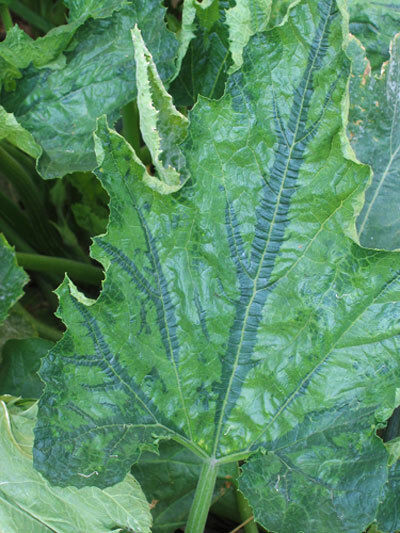 Carried by aphids which we never saw in our Guatemalan garden, this virus affects squash, pumpkin, melon, watermelon and cucumbers. 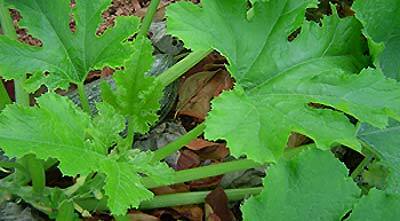 High technology has inserted ZYMV coat protein genes into zucchini, melons, and cucumbers to prevent the occurrence of the disease and to make it resistant to Bayer/Monsanto's cancer causing Roundup weed killer. 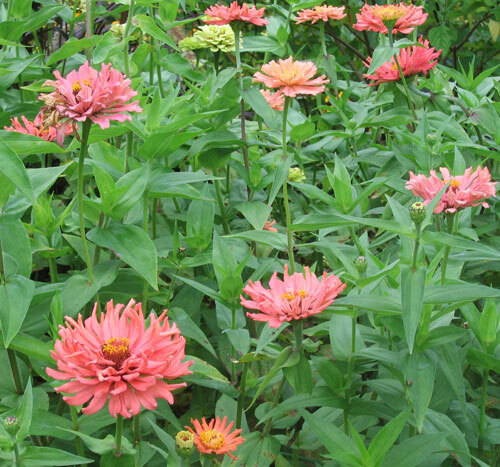 I plant only non-GMO seeds and have done so for decades without ever seeing this disease in gardens in New England, Takoma Park, MD, Taxco, Mexico and Montserrat. It appeared in 2015 in Guatemala, along with a major Clinton/Obama State Department enforced promotion of Monsanto's seeds and Roundup poisons in Guatemala and other Latin American countries. Purchased zucchini in the market in Panajachel, Guatemala, were beautiful and I vomited within 15 minutes of eating them twice. I will never opt for GMO seeds or any of Monsanto's terrible agricultural poisons. 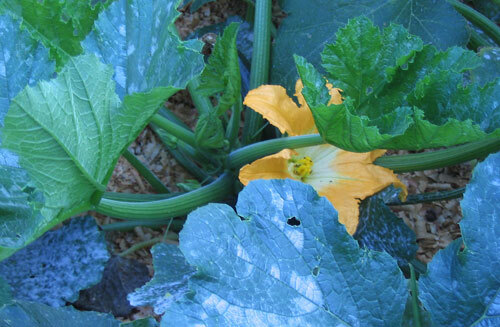 As for the fruits of an affected zucchini they are something to see. They may be safe to eat, but who would want to unless you were very very hungry. 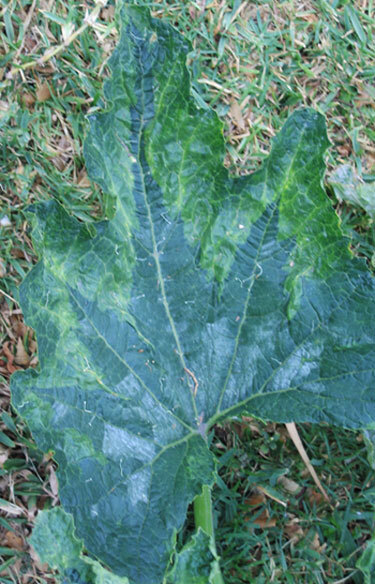 Below are photographs of what you can expect to see when your plants have been infected with the yellow mosaic virus.